On Friday Mattel debuted three new body types for its Barbie line, tall, petite and curvy, the first substantial changes to the iconic fashion doll’s figure since her bust was slimmed and her waist widened several years ago. In a long and in depth cover story at TIME, Eliana Dockterman examines the history of Barbie resistance and the impetus for adding these new doll bodies to the Barbie roster. Consumers have been complaining about Barbie’s figure since the doll debuted and Mattel has only changed things up a few times, making her “more realistic,” and adding new skin tones and hair types. The addition of Barbie sidekick/sister Skipper, though, was the only real departure from a single and slim Barbie silhouette. So why add tall, petite and curvy Barbies now? Corporate cynicism aside, there’s the question of the dolls themselves – importantly, are they cute? Well, yes. 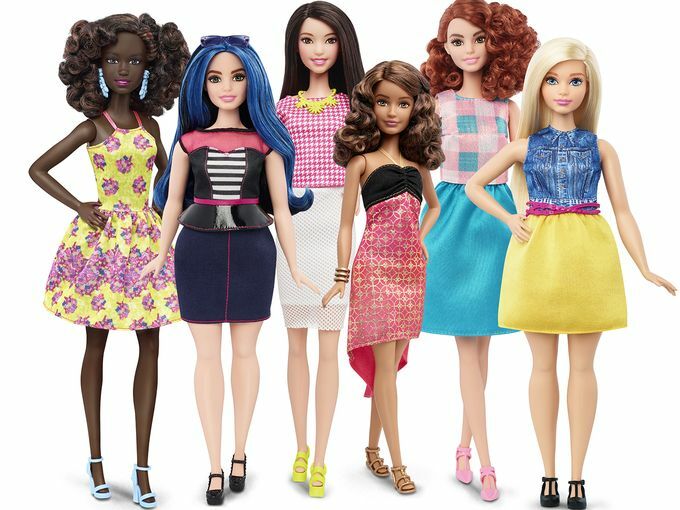 The new doll bodies are part of the Fashionista line of Barbie dolls, aimed at a more discerning doll fashion audience. Think: less large animal vet Barbie, more shopping holiday Barbie. The clothes are beautiful, of course – Barbie is an aspirational brand as much as it is a story-telling brand, and her clothes are always lovely and (usually) well made. Barbie dresses well. That’s just how it is. And then there’s the other thing: the possibility of a Barbie that looks like me or you. The expansion of the Barbie story; still aspirational and fashion-focused, but now open to people who don’t look like Barbie Barbie. Near the end of the TIME piece Dockterman quotes several girls and mothers she spoke to about the new dolls. Whatever their response to the new doll bodies and faces, all the girls know who the “real” Barbie is. All the mothers know what the “real” Barbie story is. Are these new dolls just an adjunct to the core Barbie brand, a too-late offering in a marketplace that’s moving beyond that brand, no matter how iconic? Even the kids have doubts. Mattel may have opened the door but can I ever really be a Barbie girl? Do I want to be? As the WWAC staff debated the cultural significance of the move we kept getting distracted by the dolls, their clothes, and our emotions. Oh, you got us with this one Mattel. I want this idealized femme version of myself though.